When we talk about London office space, whether that means long term or serviced offices to let, we are usually talking central London – the 19 locations that we feature on this site. Office space in Central London has always been more expensive than business premises on the outskirts or outside the capital. Rents vary within Central London. For example Holborn has always been cheaper than either the City of London or the West End. But as a general rule, the central core has had high rents (and with that high business rates) compared to the outlying areas. Historically, one solution was for businesses to rent – for example – office space in North London or East London. This would, of course, require travelling by tube or overground into the city centre for meetings with clients. Long travel times made this less than ideal – especially if frequent client meetings were essential. Office space in South London faced similar, if not worse challenges. Tube access south of the river is notably inferior. Office space in West London – e.g. Kensington or Hammersmith – remains the odd one out: office rents were pushed higher than other outlying areas both by high grade housing stock and the Heathrow factor. 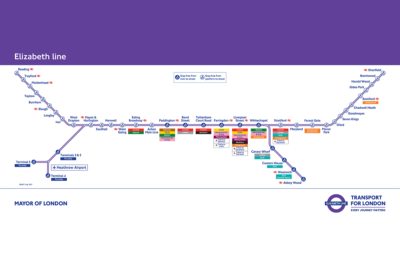 But the Elizabeth Line will change everything…for East and West London at least. In the East, places such as Stratford (7 mins to Liverpool Street), Ilford (22 mins to Tottenham Court Road) and Romford (28 mins to Canary Wharf) become viable office locations overnight. In the West, Acton (6 mins to Paddington) and Ealing Broadway (11 mins to Bond Street) also become sensible, practical locations for your business. Download the Crossrail Route Map here. Once it eventually opens, the Elizabeth Line will change everything. Rapid train times will convert unfashionable, peripheral London locations into viable office locations overnight. Some of these locations already have a good stock of offices to let. Presumably as demand increases in these areas, developers will look to create more space. The creation of serviced offices and coworking space in West London, for example, will become far more attractive projects. Maybe you are planning to look for London office space in the next year or two. If so it will definitely be worth your while considering these hitherto unfashionable locations.